On both sides of the bay a Stp and Wn was built. One of the greatest bunker losses of the island was here at Chouet Headland where, in 1991, Marine Peilstand 1, a range finder tower, fell into the quarry. Stp Krähennest at Chouet Headland is quite interesting but mostly covered. Halfway along the bay at La Garenne was Wn Garen with a 10.5 cm gun in fieldposition. Recently an Unterstand WaKoFest was located on this site but it is buried. At Le Picquerel is Wn Spitzpunkt with some remains. Next to the Houmet Taverne is a 670. Rousse Headland was mined and could be covered by the naval coastal battery Steinbruch near Les Vardes. 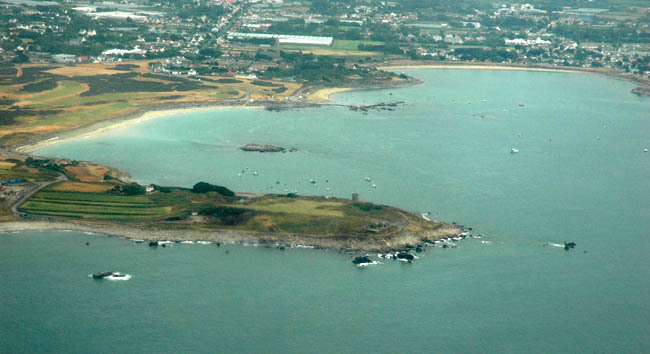 Aerial shot of Grande Havre with in front Chouet Headland (Stp Krähennest).